Sanders, a socialist, said he grew up "solidly lower middle class" in a Jewish family in Brooklyn - his father, an immigrant from Poland, sold paint for a living -and his views about the distribution of wealth were formed early. "A lack of money in my family was a very significant aspect of my growing up ... kids in my class would have new jackets, new coats, and I would get hand-me-downs," Sanders said. After his graduation from the University of Chicago, Sanders came to Vermont in the 1960s as part of the counterculture, back-to-the-land movement that turned the state from solid Yankee Republican into one of the bluest in the country. He won his first election - for Burlington mayor - by 10 votes, and since then has carried a consistent message thought eight terms in the House and now his second term in the Senate: The rich have too much, the poor and working class not enough. Sanders said the issues about which he's been railing all these years are only becoming more dire. The wealth gap has grown, and the middle class, he says, is "collapsing." Mass. Politicians Sing "Winter Wonderland"
"You have one family, the Walton family of Walmart, owning more wealth than the bottom 40 percent of the American people," he said. "We have 95 percent of all new income going to the top 1 percent. You have millions of families unable to afford to send their kids to college. People are desperately worried about whether or not they are going to retire with dignity." Sanders has a 12-step plan that he says will restore the economy and especially the middle class, most of it dependent on higher taxes on the rich and corporations. Among the proposals: A $1 trillion infrastructure building program that would "create 13 million decent-paying jobs," more worker-friendly international trade deals and legislation to strengthen unions, and transforming the U.S. energy system "away from fossil fuels and into energy efficiency and sustainable energy." He says he'll make a "gut decision" about running for the presidency - and, perhaps, challenging Democratic favorite Hillary Rodham Clinton. He would be 75 in 2016, but "my health is good," he said, knocking on a wooden conference room table. He said he couldn't remember the last time he'd called in sick to work. "Even the majority of Republicans believe that the deck is stacked against the people in this country," Devine said. "That's exactly what Bernie has been talking about for a long time." Devine, who previously worked for Sanders, said he plans to work for the Vermont senator if he enters the race. Devine said Sanders also could run on a solid legislative record in a Congress that hasn't been known for getting much done recently. As chairman of the Senate Veterans' Affairs Committee, Sanders this year got passed a $16.3 billion package designed to address problems in the troubled VA health system. His liberal-left record includes voting against the Defense of Marriage Act in 1996 and the anti-terrorism USA Patriot Act in 2001, both while he was in the House. Clinton would pose a key challenge for Sanders. 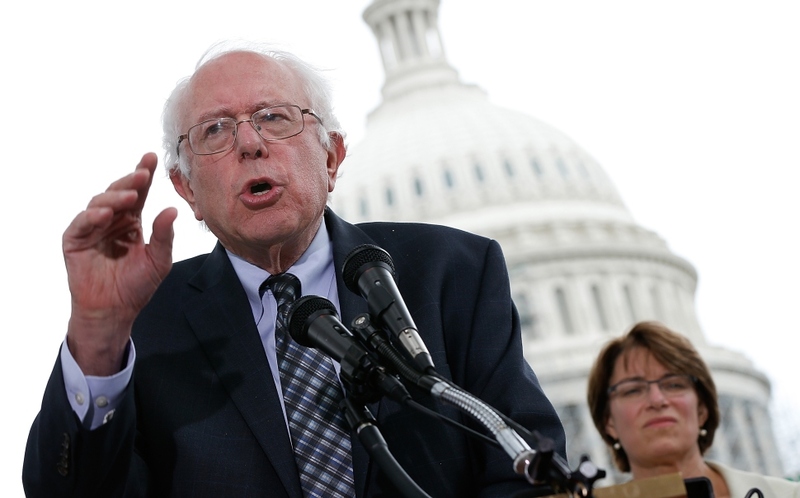 "I think the question is, is he a step too far for the mainstream of the Democratic Party? He is a socialist," said Kathy Sullivan, a member of the Democratic National Committee and a Clinton supporter. "I don't think you'll find the socialist wing of the Democratic Party is that big, contrary to what Republicans might think." Peter Burling, a former New Hampshire state senator, longtime Democratic Party leader and a Clinton supporter, said Sanders might have an advantage over her in the amount of passion he can deliver. "I don't think she demonstrated it in the race against (Barack) Obama in 2008," Burling said. Sanders would contrast with Clinton because "he can speak with unfettered passion," Burling said.